More and more, medical research indicates that “getting a good night’s sleep” equates to better mental and physical health. But for the more than 18 million American adults who suffer from sleep apnea, achieving sound sleep is an ongoing challenge. With the condition, muscles in the back of the throat fail to keep the airway open, which interrupts sleep. For some, slumber disruptions can occur as many as 30 times per hour. Previous research indicates that people with sleep apnea actually experience weaker blood flow in the brain, which can lead to damaged cells in the body. Studies published just this year (2016) also offer clues as to why people with the condition also report having poor concentration, difficulty with memory and decision-making, depression and stress. The research, carried out at the University of California School of Nursing (and published in the Journal of Sleep Research), revealed that people with sleep apnea have abnormal levels of two important brain chemicals – glutamate and gamma-amino butyric acid, also known as GABA. In these patients, GABA levels are much lower than normal while glutamate levels are much higher. Normally, GABA helps keep people calm, regulating mood and making endorphins, while glutamate acts as an accelerator that kicks in during times of stress. High levels of glutamate can be toxic to nerves and neurons. The unusual chemical levels are likely what cause the “thinking problems” reported by sleep apnea patients. If you suspect you have sleep apnea, talk with your SoFHA physician as soon as possible. Treatment for sleep Apnea often includes lifestyle changes, such as weight loss, and the use of a breathing assistance device at night, such as a continuous positive airway pressure (CPAP) machine. 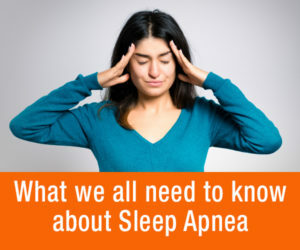 To learn more, go to the “Sleep Apnea” webpage posted on the National Sleep Foundation website. Download the Sleep Tips Sheet (PDF).